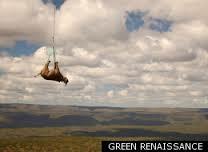 A new conservationist project is underway in South Africa to airlift rhinos to safety. The project is being managed by Rhinos Without Borders, a new organisation with approximately $280,000 or crowdfunded money, which aims to remove rhinos from overcrowded areas in South Africa to an undisclosed location in Botswana. Rhinos have been hounded to near extinction by poachers, and numbers have dropped dramatically from 16,000 in the 1970s to around just 4,000 today. White rhinos came dangerously close to extinction until a similar project rescued them and gave them a new home; now white rhinos number around 20,000 and they are a constant reminder both of the ever-increasing threat of poachers, and also of the success of relocation. Poachers are drawn to rhino populations, despite the illegality of poaching, because of the growing demand in Asian countries for rhino horn. China and Vietnam are the main consumers of traditional medicine, which often uses rhino horns to treat a variety of ailments, despite the total lack of scientific evidence to support the efficacy of rhino horn. In fact, because rhino horns are essentially made of hair, their medicinal properties are as effective as chewing your own fingernails. Unfortunately, some communities in South Africa support poaching because it is a lucrative trade, so there is little governmental protection for rhinos. In Botswana, however, there is zero tolerance of poaching, and anyone found breaking this law can legally be shot and killed. Drastic situations call for drastic measures and, with over 1000 rhinos killed by poachers in the last year in South Africa, rhino populations are reaching crisis point. Rhinos Without Borders intend to airlift 25 rhinos to safety this year, and relocate a further 65 in 2016. Conservationists hope that the new populations of rhinos in Botswana will establish large communities and save the species from extinction.